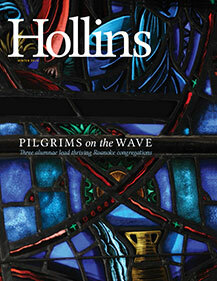 “PILGRIMS ON THE WAVE” is the cover story for this issue. Writer Pamela J. Podger profiles three alumnae who lead churches in Roanoke: Deborah Hentz Hunley ’74, Kathy O’Keeffe ’71, M.A.L.S. ’95, and Susan Emmons Bentley ’75. Note that they’re all graduates from the 1970s, a time of sweeping changes in American society, including changing attitudes toward women holding positions of authority, even in the ministry. This issue also marks the 50th anniversary of the publication of Betty Friedan’s shocking (at the time) book, The Feminine Mystique. In her lecture last fall on campus, social historian Stephanie Coontz told the audience that in 1960 Friedan provocatively titled her Good Housekeeping essay “Women Are People, Too.” That essay laid the groundwork for the publication of her book three years later—a book that many credit with helping to launch the second wave of the women’s movement. Coontz’ talk was part of a series of events last fall that looked at issues of enduring importance to women. In “GIRLS ON FIRE,” you’ll read a transcript from a meeting of first-year students assembled by Professor of English Julie Pfeiffer in which visiting writer Mary Stewart “Polly” Atwell ’00 talked about her book, Wild Girls, this year’s common reading. In “A PLAYWRIGHT’S PLEA,” public relations director Jeff Hodges M.A.L.S. ’11 profiles Elizabeth Heffron, a student in Hollins’ M.F.A. program in playwriting. Heffron’s play Mitizi’s Abortion: A Saint’s Guide to Late-Term Politics & Medicine in America, which was performed on campus last fall, explores the complexities of this hot-button issue. In “DECONSTRUCTING THE DOLLHOUSE,” Laura Jane Ramsburg, manager of museum operations for the Eleanor D. Wilson Museum, writes about last fall’s American Dreamscape exhibition, whose themes were consumerism and the hold advertising has on women, especially when it comes to creating the perfect home.